Hardback. 1st UK edn. 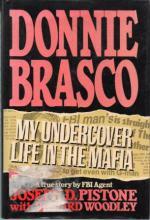 Pistone was a former FBI agent, who was the most successful infiltrator of the Mafia in law enforcement history. His testimony in such spectacularly successful prosecutions as "The Pizza Connection" and "the Mafia Commission" resulted in more than 200 indictments and 100 convictions of members of organised crime. This is the story of his 6yr. undercover life. Illus. + Epilogue. 373pp. lge. 8vo. h/back. Browned edges o/w Vg+ in sunned G++ dw. which has the remnants of a label to fr. cover (see image).